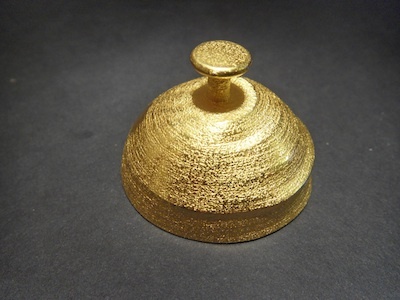 The Golden Bell of Hearing is the first example of a Physical Sonification Data Form. The sound of the bell is shaped by the dataset that has been used to form it. The choice of the bell as a metaphor provides the cues for interaction and establishes sonic expectations. The construction of the bell is described in this paper presented at the ICAD conference in Budapest in 2011. The Golden Bell of Hearing was curated by Diana Hare for the Embracing Innovation exhibition at CraftsACT in Canberra from 31 March to 7 May 2011.